There are a lot of different conspiracy theories about what happened to the Australian government in November of 1975. In a surprise move, the ultra liberal Prime Minister Gough Whitlam was fired by a lone man using parliamentary procedures that no one had expected. That man was John Kerr. And Gizmodo has now obtained the CIA’s internal biographic report on him. 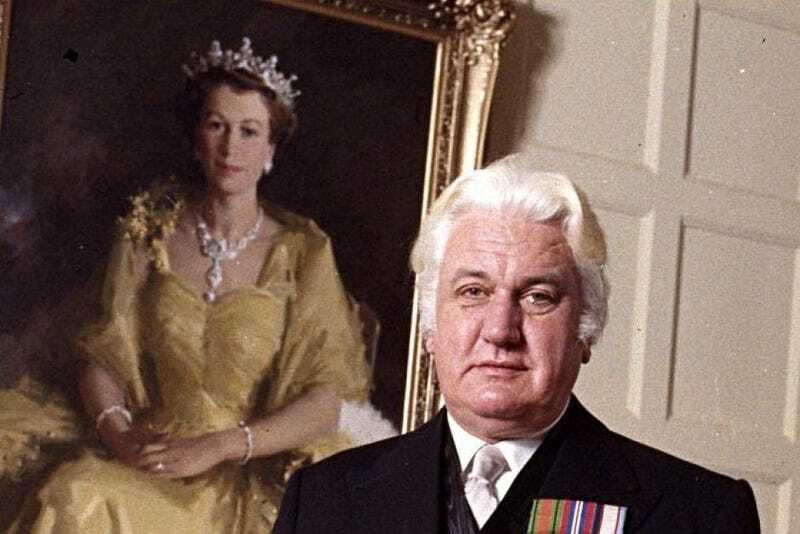 Back in June, I filed a Freedom of Information Act request with the Central Intelligence Agency for biographic reports on Sir John Kerr, the 18th Governor-General of Australia. The newly declassified report from February 27, 1976 describes Kerr’s job as “characteristically apolitical” but that he “astounded the country” when he took it upon himself to throw out Whitlam and appoint a caretaker government. Kerr dismissed Whitlam on November 11, 1975, sending the country reeling into a constitutional crisis. Such a thing had never been done before or since in Australia. And people have long suspected that British and US intelligence agencies were involved. Whitlam was replaced as Prime Minister with the conservative Malcolm Fraser. Why would US intelligence organizations care about getting Prime Minister Whitlam out of office? Whitlam was a vocal opponent of the Vietnam War, despite Australia’s commitment of troops to fight alongside the Americans—something that couldn’t be said of even a country like Canada. But more importantly to the conspiracy theorists, Whitlam opposed the NSA site in Alice Springs, Australia (known as Pine Gap) that was being used to spy on virtually all of Asia. One of the things that conspiracy theorists hang their hat on is testimony from a former US intelligence decoder (turned Soviet spy) who says that he heard someone from the CIA refer to the Governor-General as “our man Kerr” shortly before the dismissal. But most historians still aren’t convinced that US or British intelligence agencies orchestrated the ousting of Whitlam. It has since been revealed that the Queen at least knew about it, but beyond that, most think that Kerr acted alone to break a stalemate in the Senate, which has been the official line since it happened. Kerr’s personal papers sit in the Australia National Archives and aren’t scheduled to be released until the year 2027. So what can we learn from this newly declassified CIA report? Not much, unfortunately, aside from perhaps that the CIA decided to only release one report. Unlike other CIA biographic reports that I’ve obtained (like those on Chilean dictator Augusto Pinochet), there is only one version. In the case of Pinochet, I received multiple reports spanning just a few years. With Kerr, I specifically requested all reports created from 1973 through 1976. But the CIA has released just one report from February 27, 1976—dated just a few months after the dismissal. It seems unlikely that the CIA, even if they had been involved, would put such information into a simple biographic report. But when it comes to the historic 1975 dismissal of Australia’s democratically elected government, you have to turn over every rock. Perhaps some better trained eyes can tell me if there’s anything important in here that I’m missing..